For years, Cuba was and remains one of the world’s nations with the greatest share of workers employed by the state, currently about 80% of the workforce. While widespread government employment kept unemployment rates low, it engendered substantial underemployment and low labor productivity, perennial problems of Cuba’s socialist economy (Mesa-Lago 2010). Following the collapse of the Socialist world and the ensuing deep economic crisis, feeble economic reforms were made in the island to prevent the regime’s collapse, including authorizing a limited number of workers to engage in self-employment practices subject to tight regulations. These reforms, some of which were eventually reversed, barely made a dent on the underemployment picture. The current economic downturn has further accentuated the high price underemployment exacts on the Cuban economy. As part of a broader policy package designed to revitalize the Cuban economy, President Raúl Castro has stated his commitment to substantially reduce the number of state workers by reemploying them in the private sector. In the rural sector, some former state employees are to work as independent agricultural workers, whereas in the urban sector (as well as in some rural occupations where state workers will also be displaced) the expectation is that they will labor as self-employed workers, or as paid employees in micro enterprises. Urban and rural cooperatives will also play a part in the revamped labor force structure. Many, if not most, of the self-employment occupations that have been authorized have been practiced informally in Cuba for decades as part of the underground, black market economy. These types of occupations also constitute the core of economic activities in the informal sector of developing economies across the globe. The purpose of this paper is to review some of the measures the Cuban government is implementing, while offering an assessment of the extent self-employment might be capable of generating productive jobs and contribute to economic growth. The discussion begins with a review of the self-employment regulatory framework, combines the individual occupations in broader categories, and assesses them with respect to four economic characteristics, namely linkages to the economy, use of domestic or imported inputs, employment generation potential and match to the skills level of the population. The paper ends with a preliminary analysis of the economic impact of self-employment. The overall conclusion of this paper, based on the disaggregated examination of the authorized self-employment regulation regime, is similar to that reached by other analysts that have assessed the issue utilizing a broader perspective (Mesa-Lago 2010; Vidal and Pérez Villanueva 2011). Reform results can be expected to be minimal as pride of place was assigned to occupations unlikely to optimize activity in a modern economy. Thus, a majority of the authorized self-employment occupations are characterized by low productivity, low or obsolete technology, and limited growth or employment generation potential. Likewise, some of the authorized self-employment occupations, rather than contributing to the assimilation of displaced state workers, will more likely serve as conveyor belts to bring into the regulated economy former informal workers or individuals who simply were, for all intents and purposes, economically inactive. As the paper indicates, there are some notable exceptions to the overall pessimistic assessment. For these occupations with more promising outlooks to flourish, however, the government must implement an enabling regulatory framework that, rather than strangling the initiative of private sector workers, assists them to expand their economic endeavors. Among fundamental requirements for a more positive outcome to materialize are transparent and consistent regulations, less rather than more government interference, lower taxes, and the emergence of effective wholesale input distribution chains. There are ample grounds to doubt that the government will have the political will to maintain a steady reform course that would enable such developments, however, if past history serves as a guide. The expansion in the number of self-employed occupations approved by President Raúl Castro on August 1 is another indication of the urgency the leadership assigns to the implementation of drastic measures to cope with Cuba’s economic crisis. The 157 occupations authorized for self-employment in 1990 were increased to 178 in 2010 and then to 181 in 2011. These measures, and subsequent announcements that numerous self-employment permits had been issued, along with the distribution of idle land to potential private agricultural producers and anticipated conversion of some small state municipal and provincial enterprises into cooperatives (“Transformarán” 2010), can be viewed as necessary complements to the decision to substantially reduce the state’s bloated labor rolls. Plans call for the release of as many as 1.3 to 1.8 million state workers,2 or about 30% of the state work force, during the current five-year period. Many questions remain as to the ability of the Cuban economy, as presently constituted, to productively absorb such a number of workers formerly employed in the state sector. Equally problematic is whether the selfemployment policies announced, be they in agriculture or urban occupations, could provide sufficient income for workers to subsist, There are also questions as to whether or not the government will have the political will to reduce the bureaucratic impediments that could potentially interfere with the performance of self-employed workers and create commercial entities to allow prospective producers to acquire the inputs they need. The most recent data suggests that the number of permits for self-employed workers that has been issued has increased considerably since the new policies began to be implemented. State worker layoffs started in January 2011 (“El gobierno” 2011), although at a much slower pace than first intended as conditions have not been favorable for the private sector to absorb dismissed public sector workers. Just one round of dismissals is underway in the Education Ministry, where 15,000 workers are to be released prior to the conclusion of the 2010–11 academic year (“Anuncian” 2011). By the end of April, there were 310,000 self-employed workers, of which 71.6% (222,000) had received their permits since the revised rules were issued in October 2010. Prior to that, only 88,000 authorized self-employed workers remained in the island. In addition, 42,000 applicants who had received permits returned them for a variety of reasons, assumedly because they concluded that, under prevailing rules, they could not operate successfully. By July, the number of authorized selfemployed workers had increased to 325,000. Of these, 68% were previously not formerly employed, whereas the balance was accounted for by former retirees or public sector workers (“El trabajo privado” 2011). The distribution of workers by previous labor affiliation suggests authorized self-employment occupations are essentially attracting former informal sector workers, rather than recently displaced state workers. According to the available statistics, 21% of the new self-employed licenses were issued in Havana, with about a fifth of the overall number of self-employed workers across the country dedicated to the preparation and sale of food products (22%), with a further 4.5% licensed to engage in transportation activities (Cancio Isla 2011a). As indicated earlier, nearly 7 out of 10 (68%) of the newly licensed self-employed workers were not previously employed in the state sector and another 16% were retired (Espinosa Chepe 2011a). Self-employed workers furthermore had only managed to establish a modest number of micro enterprises: collectively they had employed as hired workers only 39,000 employees. In the agrarian sector, in turn, by April 2011, 143,000 workers, out of a total pool of 165,000 applicants, or 91%, had been provided with usufruct land (“El gobierno dice” 2011). Of these permits, 9,000 had been withdrawn as government auditors concluded those usufruct beneficiaries were utilizing the land “deficiently” (“Retiran tierras” 2011). In total, the combined number of self-employed (including hired) workers and land usufruct beneficiaries is well below the target of current state employees that were expected to transition to the private sector. In recognition of the immensity of the task ahead, and the need to accelerate the private sector’s capacity to absorb state workers, during the first half of 2011 the government introduced several measures to increase the dynamism of the private sector. Among these were the addition (in May) of three new selfemployment occupations (granite worker, insurance agent, and party organizer); an increase in capacity (number of places or chairs) in small restaurants (paladares) from 20 to 50; exemption from employment taxes for the remainder of 2011 for micro enterprises hiring between 1 and 5 contract workers; elimination of mandatory social security payments for older self-employed and contract workers (for men 65 years of age and older and women above 60 years of age); and reduction of temporary and permanent licensing fees for selected transportation selfemployed workers. 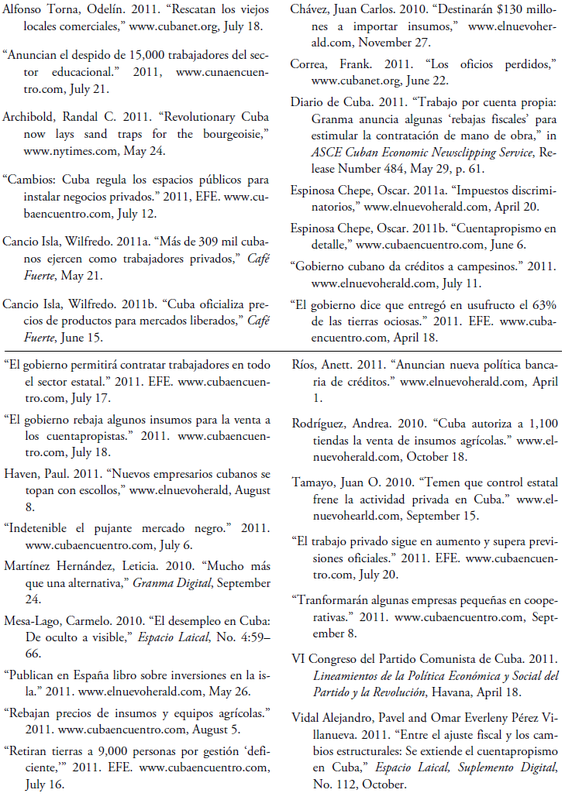 Potentially more consequential were the decisions to extend to all self-employment occupations the right to hire contract workers and to allow self-employed workers to take over commercial establishments—primarily restaurants—inefficiently managed by the state (Diario de Cuba 2011; Espinosa Chepe 2011b). In addition, numerous former commercial locales, some not in use since the late 1960s, are being reconditioned to facilitate retail activities, as new regulations have been announced to control where and how self-employed workers are to establish their commercial ventures (“Cambios” 2011; Alfonso Torna 2011). Among other significant impediments to the eventual success of self-employment is a very heavy taxation regime that may dissuade self-employed workers from profitably engaging in their crafts (Mesa-Lago 2010; Espinosa Chepe 2011a) and continued application of burdensome regulations (Tamayo 2010). Other observers note that regulations for approved self-employment occupations are too restrictive. It would have been best, they claim, to have had fewer, but more broadly defined, occupations to allow entrepreneurial self-employed workers to take maximum opportunity of available market niches. These same observers note that the authorized occupations generally demand relatively low levels of human capital and therefore fail to take advantage of Cuba’s past educational investments (Vidal and Pérez Villanueva 2011). Inadequate credit instruments are similarly perceived as a potential damper to self-employed economic activity. In response to these concerns, the government has enacted several corrective measures, some of which already have been implemented. In April 2011, for example, it was announced that the government would establish several mechanisms to offer lines of credit to self-employed workers (Ríos 2011), whereas Cuban banks have already extended credit to 13,000 small agricultural producers granted usufruct rights over formerly idle land (“Gobierno cubano” 2011). Particularly daunting appears to be the absence of wholesale markets with differentiated prices and associated distribution chains where self-employed workers and micro enterprises could acquire inputs. There seems to be a consensus that this is just as or more problematic than the credit issue. To address this concern, Mercados de Artículos Industriales y de Servicios (MAIS) are being established to supply the sector. Prices at the MAIS are said to be too high, including those for construction materials. In addition, since January 2011, some 1,000 state stores have been authorized to market—at unregulated prices— construction materials to citizens and self-employed workers alike. Hair dressing inputs are also available at some free markets (Cancio Isla 2011b). Further, in July 2011 it was announced that, according to a ministerial decision, prices for some articles (e.g., oil, tomato puree, marmalades, mayonnaise, compact discs) sold in bulk sizes at retail stores (whether in national currency or dollar stores) would be discounted by 15% to 20%. The reduced prices would apply to all comers, although the price reduction is primarily intended to benefit self-employed workers. Similar discounts will be available for self-employed workers purchasing certain kinds of tools in hard currency stores (“El gobierno rebaja” 2011). A bottleneck in the agricultural sector was partially eased when in late 2010 the government established 1,100 stores to sell nationally-produced agricultural tools and other implements in Cuban pesos, although the supplies appear to be limited in type and quality (Rodríguez 2010). Responding to a lack of demand as a result of high prices, the government announced in August 2011 price reductions of up to 60% on more than 150 agricultural inputs, including equipment (“Rebajan precios” 2011). The input supply bottleneck is regarded as so significant that a recent Spanish publication focusing on opportunities for foreign investors in Cuba identified wholesale markets as the most promising business ventures (“Publican” 2011). the extent to which, according to skill levels required, each occupational category’s ability level corresponds with Cuba’s labor force educational profile. For these purposes, I have constructed a 10 self-employment occupational category typology encompassing all authorized self-employment occupations. To an extent the categories are arbitrary.3 Other analysts may choose to group the various occupations into finer or broader categories according to alternate criteria. Appendix Table 1 presents the authorized self-employed occupations grouped under each of the 10 categories by number (according to the list of 178 occupations provided in Martínez Hernández 2010, using the numbering in this source). The three self employed occupations authorized in May 2011 are included in Appendix Table 1 by name rather than number. The order in which the occupational categories are presented corresponds to my assessment of their potential to generate economic growth and non-state jobs. A description of the principal characteristics of each broad occupational labor category and number of self-employed occupations within each follows. Construction Trades: These occupations encompass largely, but not exclusively, traditional skilled occupations associated with the fabrication, maintenance and repair of the physical infrastructure, including occupations such as masons, carpenters, lathe operators, roofers and electricians (19 authorized self-employed occupations). Personal Services: Include a broad array of services provided by skilled artisans or selected professionals to the public. They range from traditional personal services, such as those offered by barbers, manicurists and hair dressers, to child and senior care and night watchmen. Also assigned to this category are skilled personal services related to music, arts, languages and sports tutors and trainers, and provided by photographers and the Cuban equivalent of domestic travel agents (32 authorized self-employed occupations). Minor Manufacturing/Retail: This is a broad category embracing all authorized occupations entailing the joint production and retailing of a variety of goods, ranging from homemade crafts and household utensils, to prepared foods for sale in privately-managed restaurants (paladares), as well as religious articles and animals used in Santería rituals (29 authorized self-employed occupations). Transport: This category brings together a diverse set of transportation occupations covering the whole array of traditional transport modes in rural settings, plus most forms of road, maritime and rail transport, as well as those serving transportation needs in the tourist sector (20 authorized self-employed occupations). Traditional Minor Trades: These are occupations that were widespread in pre-modern societies. Today these trades provide employment to significant numbers of workers only in developing economies due to their marginal productivity, or because in more advanced economies they have been replaced by workers employed in large automated industrial facilities (e.g., weavers, bookbinders, tailors) producing massive quantities of goods. Traditional minor trades authorized in Cuba also include the repair of articles of day-to-day use such as bicycles, mattresses, eyeglasses, knife sharpeners, and—a rarity these days even in some of the poorest countries—refillers of disposable cigarette lighters (54 authorized self-employed occupations). Retail: These occupations relate to the trading of goods not produced by the retailer or to facilitating the rental of physical facilities owned by others. The authorized occupations are: purchase/seller of musical CDs and other musical venues; purchaser/seller of used books; renters of private rooms within their own households; and, potentially more significant, retailers of agricultural produce at point of sales, including small stores (quioscos) (4 authorized self-employed occupations). Entertainment: Groups all occupations whereby entertainers cater to national audiences and foreign tourists. The category includes self-employed occupations such as “party animators, clowns and magicians,” “exhibitors of trained animals,” and “audio operators,” to several categories of street entertainers, including folkloric dancers, musical groups, caricature and landscape painters, and card readers (17 authorized self-employed occupations). Hired Workers: Consists of three approved occupations: occasional rural laborer, private contractor, and contract worker. The last one applies to employees hired by self-employed workers (3 authorized self-employed occupations). Modern Technical: Consists of a single occupation, programmers of computational equipment, an IT-related occupation (1 authorized self-employment occupation). Rental: Groups occupations that involve the temporary provision by a vendor to a customer of animals or garments in return for a monetary fee. Two such occupations were authorized: renters of animals and of suits (garments) (2 authorized self-employed occupations). employ productively the better educated Cuban workers. To facilitate analysis and comparability across self employment occupational categories, a five points scale was devised (1 – Minimal; 2 – Some; 3 – Potentially significant; 4 – Significant; and, 5 – Considerable) and applied within each occupational category for several economic variables (forward and backward linkages; reliance on domestic and foreign inputs; labor absorptive capacity/employment creation; and educational profile match). Results of the application of the scale are shown in Table 1. The following paragraphs discuss the likely capacity of each self employment occupational category to grow the economy and create jobs. Construction Trades: The economic growth potential and employment generating capacity of this selfemployed occupational category is perhaps the most significant among all self-employed occupational categories as it has—conceptually at least—significant backward and forward production linkages. This has not been lost on a leadership that after innumerable failures finally decided to look at private initiative to address the country’s chronic housing crisis. Increasing and improving the housing stock is a national priority as evidenced by the 2010 decision to issue private construction licenses and facilitate the acquisition of construction materials by private parties. Since many, but not all, construction inputs can be fabricated domestically, there are obvious backward linkages as these authorized self-employed occupations are mutually supportive, a rationale subsumed under the revised economic guidelines issued in 2011 (VI Congreso 2011). Forward linkages may also materialize if the leadership makes good on its promise to consider utilizing self-employed workers and micro enterprises as vendors in government construction projects, a particularly attractive alternative as the tourism infrastructure—from hotels to golf courses—continues to expand (Archibold 2011). Thus, in this analysis, potential backward linkages and reliance on domestic inputs are regarded favorably, although tempered by the continued likely imposition of state imposed bureaucratic rules designed to limit the growth of micro enterprises. So are forward linkages to the extent micro enterprises may be allowed to compete with government-sponsored construction units. Because of policy uncertainty, a range of scores (see Table 1) is assigned to potential forward and backward linkages. The more liberalized the regulatory regime, the more dynamic the linkages are likely to be. Under those assumptions, the labor absorptive capacity of the construction trades is likely to be highly significant provided liberalization rules are maintained (or even expanded) and foreign input supply bottlenecks gradually addressed as indicated by the authorities (Chávez 2010). As a result of these considerations, the employment potential variable also warrants a range of scores. There is obviously an imbalance between the skill sets demanded for productive construction workers and soon-to-be-released government employees, whose only qualifications may be prior experience in the poorly performing housing construction micro brigades. What may be anticipated is that if self-employment and micro enterprise incentives are maintained for the construction trades, state skilled workers would migrate into the private sector in expectation of earning higher wages. Under this scenario, the more vibrant emerging micro enterprises may absorb displaced government workers at both the higher and lower entry level rungs of the construction trades. Personal Services: This category includes most activities eliminated during the late 1960s as part of the Revolutionary Offensive, when most small businesses were taken over by the state. Since then, many of these services have been offered through poorly-managed state outlets (e.g., barber shops and hair dressing salons) or the informal economy. The personal services category also includes skilled services provided by educational tutors and instructors. Some employment growth may be expected with the least skilled personal services, to the extent economic reforms are successful, and perhaps with the more skilled. Personal services depend on imports to a limited extent and have weak linkages with other sectors of the economy. The ranks of skilled tutors and trainers are not likely to swell with the migration of well-educated, laid off government workers to this self-employment occupational category as demand for their services is not likely to expand due to prevailing demographic trends. In addition, most tutors, given the relative invisibility of how their services are provided, may prefer to remain in the informal economy to avoid paying taxes and other fees. Minor Manufacturing/Retail: Nearly all authorized self-employment occupations within this category include the artisanal production and subsequent direct sale by the worker of a variety of goods and services. The intent of formalizing these occupations appears to have been, as with many others, to remove them from the informal economy, while regulating and taxing them. The occupations range from relatively minor trades with limited employment potential, such as building and selling piñatas for children’s parties, to the more consequential artisanal production of consumer goods such as shoes and cleaning utensils. Engaging in these occupations in the past entailed relying on inputs obtained through the black market—often pilfered from government-owned shops. The employment growth potential of these occupations may be constrained by the lack of production inputs and limited market demand. It may also be constrained by consumer preferences for foreign manufactured goods over low-quality domestic artisanal articles, particularly if migrant remittances continue to flow to relatives in the island thereby increasing their purchasing power. That may not be the case with self-employment occupations having to do with the preparation and sale of food stuffs in paladares and other types of establishments dispensing prepared foods (e.g., small corner stores and home delivery). These establishments, paladares in particular, are likely to expand considerably as the number of customers (number of allowed seats or chairs) within them was increased, as previously indicated, to 50, at the same time that prohibitions barring hiring non-family members as contract workers and serving seafood- and beef-based dishes were eliminated. The fact remains nonetheless that the restaurant business in Cuba, as elsewhere, is an easy entry business (in terms of skills and capital requirements) characterized by stiff competition, low profit margins, and prone to one of the highest mortality rates among small businesses. This reality is illustrated by recent accounts suggesting prepared food vendors are disproportionately represented among the authorized self-employed occupation workers voluntarily returning their employment permits to the authorities (Haven 2011). Success in this sector is associated with the performance of the tourist industry and the availability of inputs provided by domestic producers of foodstuffs inputs. In light of such features, and Cuba’s low average income levels, the expectation for paladares to become dynamic micro enterprises with potential to employ large number of displaced government workers may be overly optimistic. This is true even if many government- operated cafeterias are closed, as subsidies are reduced in the expectation of achieving efficiency gains. Moreover, to the extent paladares succeed in catering to foreign tourists, they will simply siphon away diners from hotels and other formal restaurants owned or co-managed by the government as the demand for such services by local residents—other than those receiving remittances—will remain limited. The net result on employment of an increase in the number of paladares, therefore, may be nil, as employment gain in paladares may be offset by losses in employment in formal dining establishments. That would not be necessarily the case if paladares were to blossom, and make Cuba a more attractive tourist destination by helping the country overcome an image of relative dullness among some visitors who view the entertainment landscape beyond hotels as poorly diversified. Transport: Of the 20 authorized self-employment occupations under this rubric, several correspond to obsolete, animal-drawn modes of transport with limited growth potential. Others correspond to the modern transportation sector and could potentially be in competition with services offered by state enterprises. Substitution of one by the other is not likely to give rise to any net employment gains, although there is considerable scope for growth given the deteriorated state of the national transportation infrastructure and urgent demand for improved service. Recent authorization to trade post-1959/60 automobiles, a practice previously banned, may bring about an increase in paid public transportation (e.g., taxis). The expectation seems to be that many self-employed transport workers will purchase vehicles. There is some scope to increase employment in this sector, but at skill levels well below the average of public servants who are about to be dismissed. Traditional Minor Trades: These are primarily subsistence and minor repair occupations, a majority of which historically were performed on an artisanal basis and more recently as part of the informal, underground economy. Though they account for the majority of authorized self-employment occupations, their labor absorption capacity, barring some exceptions, is limited. With modest formal skill attributes, many occupations in this category require minimal training (e.g., shoe shiner). Furthermore, developments in the Cuban economy over the last five decades have rendered some of these crafts largely inconsequential. In the fishing sector, for example, prohibitions barring the use of small boats by independent fishermen have essentially done away with the demand for articles (e.g., nets) formerly supplied by skilled artisans (Correa 2011). Aside from satisfying consumer priority needs, and regularizing how these activities are performed, not much can be anticipated regarding increased economic activity arising from the minor trade occupations. A potential benefit would be a gain in efficiency assuming these artisans get better access to inputs should efficient and well-stocked supply chains materialize. While some occupations within this category have linkages to the rest of the economy, they are not substantial and would depend almost solely on the availability of domestic inputs. Questions can even be raised as to the willingness of current minor trade artisans to enter the formal economy by being licensed as authorized self-employed workers. As such they would have to bear high tax and social security burdens, together with a restrictive and onerous regulatory environment. Counteracting the possible formalization of workers in the traditional minor trades is the expectation by some observers that the impetus for informal economic activities rather than declining may increase. This would be the case if the government were unable to satisfy the requirements of authorized selfemployed workers and micro enterprise for production inputs in formal markets as demand increases (“Indetenible” 2011). It goes without saying that there is a broad mismatch between traditional minor trade skill sets and those prevalent among the soonto- be-dismissed better educated state sector workers. Retail: Of the four authorized self-employed occupations in this category, two (i.e., buyers/sellers of used books and of music CDs) have limited prospects even under the best of circumstances. The third, renters of private rooms, may soon approach an employment ceiling as rentals of private accommodations to foreign tourists is already widespread and regulated. Another damper to private room rentals is Cuba’s serious housing shortage. The last occupational category, vendors of agricultural produce, has a much greater employment potential in an environment where national distribution is dominated by the acopio system, and where idle agricultural land is being distributed to independent farmers with the intention of increasing domestic food production. Realizing this promise is far from certain given past ideological pronouncements, continuous over regulation of economic activity, and official reticence to allow agricultural product prices to be set by market forces. Entertainment: These authorized self-employment occupations include several that, in economies with well-developed tourist industries, would be considered as belonging to the formal sector (e.g., hotel musicians), and others that would be regarded as part of the informal economy (e.g., street dancers and painters). In Cuba’s case, the genesis of many of these activities was informality and opportunities to hustle foreign visitors in a depressed economy. These occupations also include a few domestic entertainment niches found in practically every cultural setting to enrich social and familial events (e.g., clowns, party organizers). In most cases, formalization of these occupations will entail that self-employed workers comply with tax, social security, and regulatory obligations. Therefore, resistance to operate as authorized self-employed workers should be anticipated. When regularization becomes inevitable, licensed self-employed workers are likely to falsify income declarations to minimize financial obligations to the state. Little should be expected from this occupational category in terms of labor absorption other than that warranted by increases in international tourist flows. Hired Workers: The labor absorption capacity of this category hinges on the ability of urban authorized self-employed workers, micro enterprises, urban and agricultural cooperatives and agricultural usufruct land producers to prosper and contract hired labor. As noted here, prospects are not very promising for many of the authorized self-employment occupations. More optimistic prospects for others will hinge on economy-wide growth performance and the steadiness with which economic reforms are implemented, sustained and/or deepened. Modern Technical: The skill content of the only authorized self-employment occupation under this category, while consonant with the high educational attainment of trained public sector workers, begs the question of how significant will be the demand for computer programmer services. Cuba has one of the lowest Internet penetration rates in the world and few citizens have access to personal computers, as computers have been used almost exclusively for official purposes. For the foreseeable future, the capacity of the self-employed sector to assimilate displaced computer programmers is finite unless connectivity policies are modified and much greater popular access to computers allowed. Under more auspicious circumstances the potential for backward and forward linkages for this authorized self-employment occupation would be significant. Rental: The employment and economic growth potential of these category is obviously quite limited. The main conclusion from the information reviewed in this paper is that the self-employment reforms promulgated by the Cuban regime under Raúl Castro’s leadership will fall short of their goal of creating viable employment alternatives for many of the more than one million workers slated to be released from state employment. One obvious observation is that the skill matrix of the authorized self-employed occupations does not match up well with the educational profile of the better educated average Cuban government worker. Furthermore, entrepreneurship is an attribute that is not universally shared. Many to-be-displaced state workers may not be predisposed to entrepreneurial initiatives, particularly after years or even decades of working for a paternalistic state. Furthermore, the authorized self-employment occupations exclude those that favor more dynamic economic sectors dependent on human capital. The reform emphasis instead was placed on occupations requiring narrow skills and having low productivity. Since many of these employment niches were previously occupied by informal economy workers, the authorized self-employment occupations may do more to regularize the status of informal workers than to create alternative employment opportunities for current state employees. Thus, the latest self-employment occupational reforms assume a minimalist approach to the excess state labor supply issue, assigns prominence to far too many obsolete, low-productivity occupations, and may serve more to transfer workers from the informal to the formal sector than to developing alternative employment opportunities for state workers who will lose their jobs. This negative overall assessment does not apply to all authorized self-employment occupations. For some, for instance those in the construction trades, selected personal services and minor manufacturing/retail occupations, the prospects are brighter. For self-employed workers in these occupations to do well, however, the government will have to maintain a steady hand, providing a regulatory environment that facilitates rather than hinders private initiative. This calls for consistent and increasingly more liberal rules, avoiding the ever present temptation of interfering in factor markets, implementing a less onerous taxation regime, and establishing functioning wholesale input markets. Those familiar with recent Cuban history are well aware that these conditions have been anathema to the revolutionary leadership, particularly under Fidel Castro. Whether or not his brother can take a somewhat different tack remains to be seen. 1. I am grateful to Jorge Pérez-López for his assistance in the conceptualization of this paper. His comments, as well of those of René Costales on an earlier draft, were most welcomed. 2. The actual number of state workers to be dismissed has been variously cited in different sources. 3. It is possible, in some cases, to derive different interpretations of what a self-employment occupation stands for. For example, selfemployed occupation number 4 is labeled “Alquiler de animales” (Animal rental). Does the definition apply to the rental of breeding bulls or bullocks to independent farmers, the hiring of ponies for children’s rides, or both?